I'm going for a swim... I kind of like to have the place to myself. Henry David Thoreau is an American intellectual icon; what made him so was the decade between his graduation from Harvard and the years he spent in a cabin he built himself on Ralph Waldo Emerson's land at Walden Pond--the formative decade that turned him into one of America's most influential writers. In a detailed and textured narrative, Sims brings Thoreau to life--striding across the page like a radical folksinger rather than the curmudgeonly recluse who occupies our mental image of Walden Pond. In this youthful period, he wrote his first book and refined the journal entries that formed the core of his later work, Walden; joined the anti-slavery campaign and studied Native American culture; spent the night in jail that led to his celebrated essay Civil Disobedience, which would inspire the likes of Gandhi and Martin Luther King; developed a scientific/poetic response to nature; and aligned himself with the Transcendentalism , which questioned assumptions about God, citizenship, and the Industrial Revolution. Sims relates intimate moments in Thoreau's daily life--teaching Nathaniel Hawthorne to row a boat; tutoring Emerson's nephew on Staten Island--and the deep influence of his parents and his beloved older brother, John, whose tragic early death haunted him. 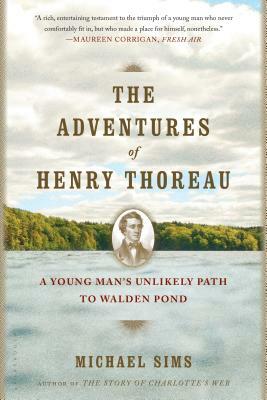 Chronicling Thoreau's youthful transformation, Sims shows how his intellectual development would resonate for the rest of his life, and throughout American literature and history. Michael Sims is the author of the acclaimed The Story of Charlotte's Web, Apollo's Fire: A Day on Earth in Nature and Imagination, Adam's Navel: A Natural and Cultural History of the Human Form, and editor of Dracula's Guest: A Connoisseur's Collection of Victorian Vampire Stories and The Dead Witness: A Connoisseurs Collection of Victorian Detective Stories. He lives in western Pennsylvania.